When you do a lot of your work in terminals, you could get cluttered with all of those terminals open. Eventually, you are going to be using time to actually find the correct terminal, and everyone does not want to be wasting time trying to find their work. Sure, you can use tabs with your terminals, but some people need to see multiple terminals at once. A good way to make this a reality is to use special terminal apps that allow you to have multiple terminals running, but with all of them in a single window. I personally recommend you use Terminator, it was featured on the Linux Action Show in one of its recent episodes. But the main source of the reason for why I made this post is because of this picture that was uploaded in the #jupiterbroadcasting chat room on irc.geekshed.net. 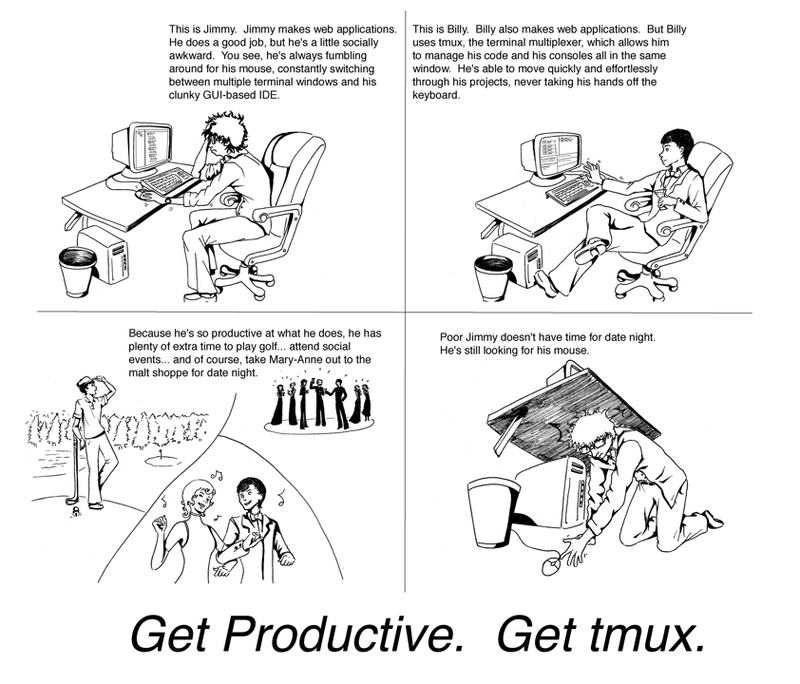 This picture talks about tmux. You can also insert Terminator if you wish. Click the picture to expand it, because it is smaller than actual size to fit inside of this blog post.